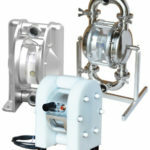 The new TC pumps are fitted with LEAP – Low Energy Air Pump – technology used in AODD pumps to reduce the minimum operating air pressure by reducing internal losses and friction. LEAP uses a indirect system to detect the position of the diaphragm shaft controlling the diaphragm movement automatically. Main air valve can be changed in less than two minutes without the removal of the pump from the process line. Integral solenoid valve control negates the need for an external pneumatic solenoid valve, reducing costs and simplifying control. Integral VFC output signal allows for external monitoring of pump strokes.